May, 1965. Since our last entry, the Doctor, Ian and Barbara have rescued Briton of the future Vicki, caused Rome to burn, visited the planet of the insects and been caught up in a bizarre hybrid of comedy and timey-wimey sci-fi on the planet Xeros. No wonder as this story starts they’re all taking a week off. There’s an old story that certain editions of Trivial Pursuit contained the question “Who created Doctor Who?” The answer given was Terry Nation. For many fans, that’s a laughable assertion given that Nation is more well known as the hack whom Barry Letts accused of trying to sell the same script four times. And there’s no doubt that Nation was at the least a lazy writer – this is his fourth script for the show and already he’s done two dead planets and two deadly jungles. But to focus on the repetitive elements in his work tends to overlook how much he actually did contribute to Doctor Who, and just how creative a writer he can be – even in a piece of work that’s as widely derided as The Chase. The opening episode, for example, has some beautifully judged comic lines (unsurprising, given Nation started his writing career with a script for The Goon Show), and is as charming as anything the series has offered to date. And more than that, it’s clever enough to actually play with the idea of the series as a TV show by having the Doctor fire up his own space/time television and tune into various historical events, making the TARDIS the equivalent of the viewing public’s living room, to the extent of having the crew contend with fuzzy screens and BBC continuity announcers. Later, he has Ian – who’s already said a book on space monsters is “a bit far-fetched” – point out that Daleks don’t like stairs, just like everyone’s dad will have been doing for the last year. When we see this kind of playful self-awareness in Season 17, it is championed as another example of Douglas Adams’ legendary wit. We should equally praise Nation’s sophistication here. But more than that, Nation is not only recognising Doctor Who as a TV show. He also makes The Chase into a celebration of the show’s clichés – the regulars keep getting knocked out, there are exotic locations that change unpredictably from alien planet to Earth history week on week, it’s a weird mix of horror and comedy, there at least five new monsters on top of the Daleks, Hartnell has an unconvincing stand-in and the whole thing is a chase. What’s astonishing is that most of the tropes of Doctor Who have already been nailed within its first 18 months on the air; that Nation consciously puts them all together, and even starts to poke fun at them, compressing what could be four or five serials into one. What this means is that by May 1965, Doctor Who was enough of an institution to have its own recognisable house style, and The Chase is interesting because it plays as a rapid montage of all the different things the show can do. No wonder the Beatles are in it: this is Doctor Who’s version of their Help movie, another pop artefact inspired by the anarchic comedy of the Goons. And while Beatlemania was going on in the charts, Dalekmania was underway in the toyshops. 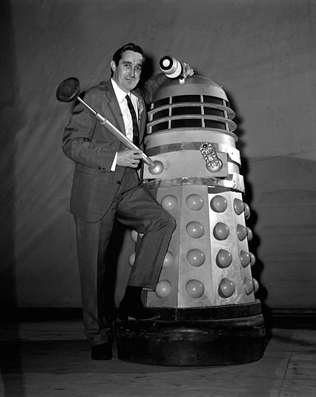 Later in 1965 the Dr. Who and the Daleks movie was released. At this point the series was regularly pulling in audiences in excess of 10 million. This is as good as it got in the 1960s – and only Hinchcliffe-era Tom Baker and Series Four David Tennant have ever beaten it. In the space of 18 months, Doctor Who has gone from a mild curiosity in a junkyard to a British pop-cultural phenomenon – and this is the TV show’s ultimate expression of that. In the fourth episode, Terry Nation implicitly places the Daleks on a level of screen villainy equal to that of Dracula and Frankenstein’s monster. 48 years later, we can see he was dead right. Ah, the Daleks. Because for all this is a celebration of Doctor Who, Nation never lets us forget it’s his creations that made the show a success. The first four Dalek stories are a fascinating study in escalating stakes. They start off plotting evil from their space city, then they conquer the Earth. Now, they’ve got a time machine and they don’t have to wait for the Doctor to come and disrupt their plans – they can follow him and wreck all his adventures. This is the first time that the Daleks know who the Doctor is. I suggested in the last post that the Doctor has defined the Daleks as his greatest enemy, and this helps establish him as a hero. The Daleks changed his nature. But equally, he has changed their nature: through knowing him, they have evolved into time travellers with the whole of the universe as their stage, and in a position to put the very nature of the Doctor’s power under threat. Before The Chase, the Doctor was unique in his ability to travel anywhere in time and space in a box that’s bigger on the inside. This is the first time he’s had to face a threat with the same power (and interestingly, in the very next story he’s going to have to face it again). And because they are now able to follow the Doctor anywhere in time and space, the Daleks are placing the show’s very ability to continue in danger. This serial has to be a chase, to show the Daleks can now drop into other space adventures or historicals. Everything the show has done to this point is unsustainable if the Daleks are not defeated. No wonder there’s an episode called The Death of Doctor Who: that’s exactly what’s at stake here. It’s hard to think of how you can make the Daleks much more of a threat. Later in the year The Daleks’ Master Plan plays a clever sleight of hand by having the Daleks use their power over time as a threat to the universe rather than the Doctor himself. In many ways their next story is stronger because it’s better made, more obviously epic, and has two companion deaths with which to make its point. But it doesn’t strike at the heart of the series quite as much as this. Of course, the Daleks are defeated. But again, there’s a price to pay. Having lost Susan at the end of the last Dalek serial, now Ian and Barbara say their goodbyes in a lovely little sequence that has them arrive back in a junkyard in London. But, here’s Nation’s last clever touch: rather than the Doctor taking them home, he and Vicki watch it all on TV. Six months ago, the show would have ended if the Doctor got Ian and Barbara home. Instead, the story finishes with the Doctor and Vicki switching off the telly and flying off into space and time to have more adventures. And there you have it. The paradox of Terry Nation is also the paradox of The Chase: a shameless hack work that’s also deliriously inventive, showing a total disregard for the constraints of what could be done on TV in 1965 and in so doing showing what might be done. In a very real sense, Terry Nation did invent Doctor Who. Next Time: “It’s not only his face that’s changed – he doesn’t even act like him.” The new Doctor faces an old enemy in The Power of the Daleks.